Still stands proud as one of the band's finest albums. 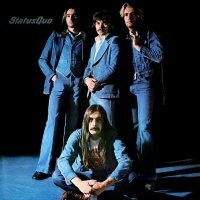 This was Quo's ninth album, but my first. I was eleven in 1978, and at the recommendation of a school friend I asked my father to buy me any Status Quo album with my pocket money allowance. I sat up late waiting for him to arrive, only to realise I had no record player! Earphones handed to me, I sat at the family stereo system staring at the open gatefold sleeve, the band engulfed together in dry ice with heads down and only John Coghlans solemn face visible behind his drum kit – there was something primal that gripped me! On the sleeve, the band stood long haired in denim, looking like a Viking clan. I knew my days of wearing corduroys and reading comics were about to become a thing of the past. The first strummed bars of 'Is There A Better Way' still resonate with me today, the guitar power of Quo at their heaviest. The lyrics took me on a journey telling me there was a better way, I was signed up and ready to leave. Some of the songs fell flat and still do; 'Mad About The Boy', 'Blue For You' and 'Ease Your Mind' were just plain soppy to my young ears, and even with age they are still weak. 'Ring Of A Change' and 'That's A Fact' have such great Pop groove, you could almost dance to them. 'Rolling Home', at the time, was the fastest song I had ever heard a band play, until I heard 'Bomber' by Motörhead! 'Rain' and 'Mystery Song' are two of the bands' greatest songs, both released as singles and written and sung by the late Rick Parfitt. This was my introduction to my first Rock star hero, and the band – especially Parfitt – were the first musicians to grace my wall on a poster. They changed the way I looked, thought, and opened up a lifelong love of Rock music that has stayed with me to this day. 'Blue For You' still stands proud as one of the band's finest albums – I never tire of hearing it. During the Frantic Four reunion shows, Quo dusted off 'Is There A Better Way', I was immediately taken back to the first time I heard it and thought of the long Rock 'n' Roll path that the album led me down to today. I lay the blame firmly at the feet of Status Quo.